Sunday, August 12, Haley got baptized! It was a very special day. 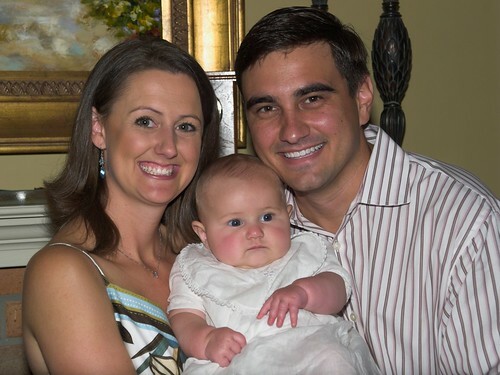 Hayden and I were beaming with pride and joy as we dedicated our baby girl to Christ. Haley looked like an Angel in the special Christening gown she wore. She wore the “Platten Family Gown” that was made for my Dad’s mother, by her Great-Grandmother…and has been worn by almost every Platten since (including my Dad, sisters, and I). So, without saying, you can imagine how priceless this dress is to us. I am so glad Haley was able to wear it on her special day. After church, we had everyone to our house for a big lunch. Hayden’s family (parents, Laura, Ryan, and Grandmother) were in town, my family, and many special friends from church joined us to celebrate. Kathleen and Julie are now off to college- KJ at Mississippi State and Julie at University of Miami of Ohio, for graduate school. I was SO sad because they both left the same weekend and the summer was NOT long enough. I’m going to miss them a ton. Luckily, we’ll be able to see KJ several times over the next few months because football season is right around the corner and you know we’ll be in Starkville to see the Dawgs play…no matter how well they do! Another big milestone was hit by Haley as well. She started eating cereal this week! I mention it because we’ve got a video of it on the “video” page. Check it out, it’s so cute! Little hungry tiger. She caught on amazingly fast and loves to eat…obviously, check out those cheeks and thighs! She’ll be on cereal for two weeks then we’ll add in vegetables…and have to take more pictures because if she’s anything like me she’ll make a ton of funny faces showing us how disgusting they are!